White gas versus cartridges is a debate that had some pretty opinionated folks on both sides of the issue. 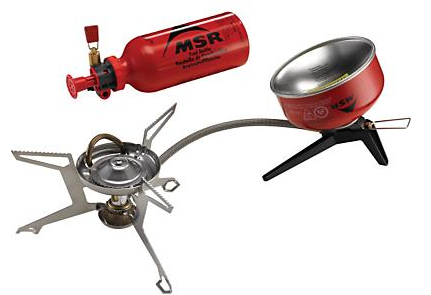 This is a universal fuel stove from MSR that uses cartridges or bottled white gas, kerosene or alcohol.I have not reviewed this, but hope to in the near future. The following is from an email newsletter from Dave Miller, owner of California Alpine Guides and International Alpine Guides. His word is gospel with me. Dave led the winter mountaineering trek in the Sawtooths of the Eastern Sierras that I took in late December 2012 (see Mountaineering Snowshoe Failure. and Asolo Boots: Rave, Mtn Hardware Shell: Rant for a couple of my posts on that trip.). "The age-old argument over which type of fuel is best for back packing stoves may never die. But here is a mostly impartial breakdown of the pros and cons of both types of fuels from our experience. "What we are talking about here is the debate between using a liquid fuel stove such as white gas or using a cartridge with a butane mix. Both types of fuels have their place, but there are also situations where one over the other is the smart choice. "A white gas stove is far more efficient and economical if you are cooking or melting snow for a large group or for extended periods. They are also more environmentally sound since there are no disposable canisters. In addition, white gas is the choice for cold temperatures below freezing. The disadvantages of a white gas stove is that they are trickier to operate, require priming and the stove unit is heavier. "A canister stove is far lighter and far easier to operate and is a great choice or one or two people on a 2-4 day trip in above freezing temps. The disadvantages are that they just don't work well in colder temps as the fuel canister needs to stay warm in which to operate properly. Not a problem in the summer or if you are using it for a short period of time in the winter. Another issue is that the number of canisters required for a larger group or extended trip make them much more bulky than white gas. The same goes for the cost of fuel on bigger trips. "Hope this helps. We have both types of stoves. You will find us using white gas on most of our guided group trips. But if we are going light and fast on our own, you may find us using a Jet Boil or similar canister system. " Thanks for sharing such a great post. This will really gonna help me a lot.